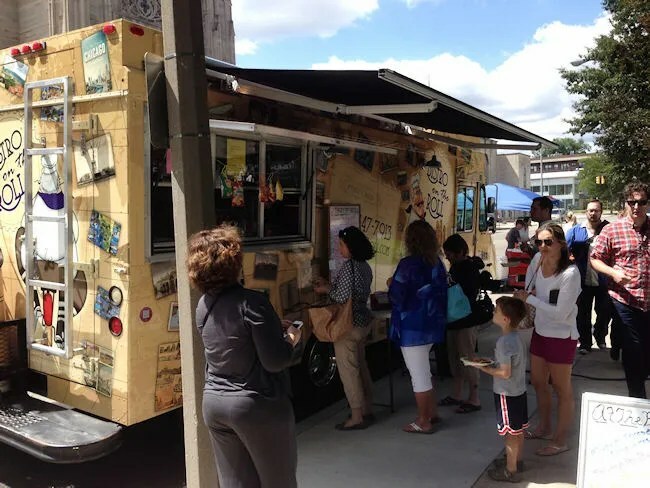 Last summer, the City of Kalamazoo introduced Lunchtime Live on Friday’s during the summer. They invite a number of food trucks then provide some entertainment in Bronson Park for a couple hours. J and I took advantage of it a couple of times last summer, but we were yet to make it down to the park this summer. This past Friday, I sent J a message around 11:30 asking if she’d like to me L and I for lunch. She was up for it, so when she was bout to leave work, L and I headed downtown. J beat us so she got in line at the Twisted Tail to get some of their fantastic Bacon Mac & Cheese. While she was waiting there, I headed over to Pig Out, Take Out to get J some Pig Out Fries. 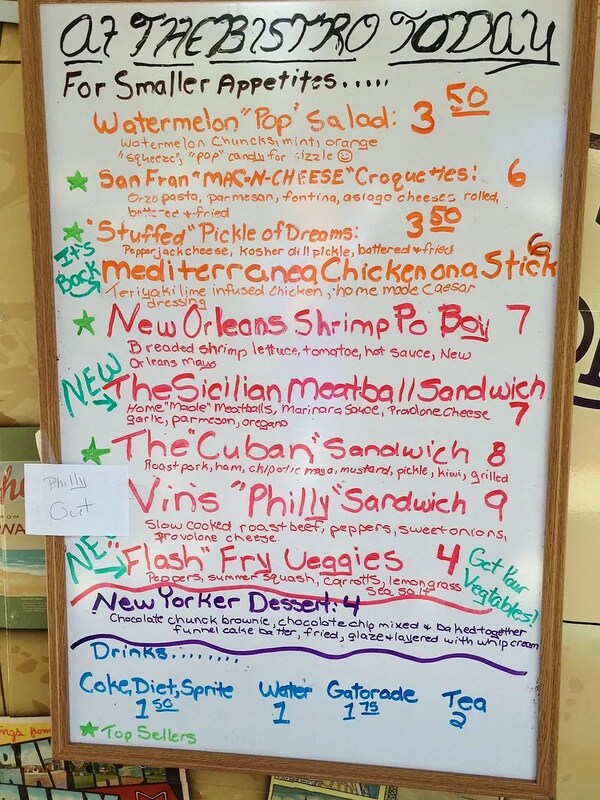 I was going to pick up a sandwich from there, but there happened to be another food truck just down the street from them that I haven’t tried yet….so of course, I go for something new. 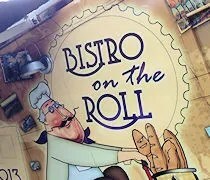 Bistro on the Roll is an upscale sandwich truck that seems to have just popped up this summer. I saw them for the first time about a month ago Fontana Chamber Music in the Park concerts. We had brought some sandwiches from Penn Station with us that night, so I didn’t even walk over to see what they had. The line was sort of long when I walked up and it was taking quite a while to get things out the window. Still, I stuck it out and waited patiently for my turn to order. My plan was to just get a sandwich, but one of the appetizers sounded way too good to pass up. I started with my order with a sandwich. 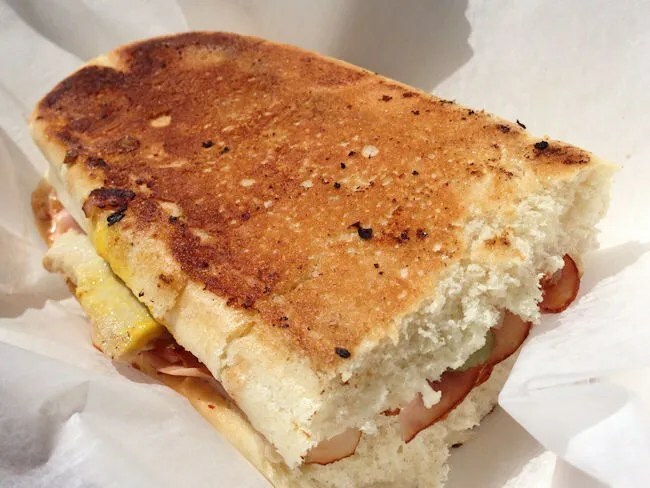 I ordered The “Cuban.” This sandwich is a take on a traditional Cuban sandwich. It’s slow roasted pork, oven baked ham, kiwi, Swiss cheese, dill pickle slices, Chipotle mayo and yellow mustard and served on a home made roll. The kiwi was an interesting addition and didn’t do a whole lot for me. I ended up taking it off because I thought the sandwich was delicious without it. The pork and the ham were so tender and the bread made this sandwich stand out. It’s not a huge sandwich, but it does pack huge flavor. The appetizer I ordered was the “San Fran Mac-N-Cheese” Croquettes. 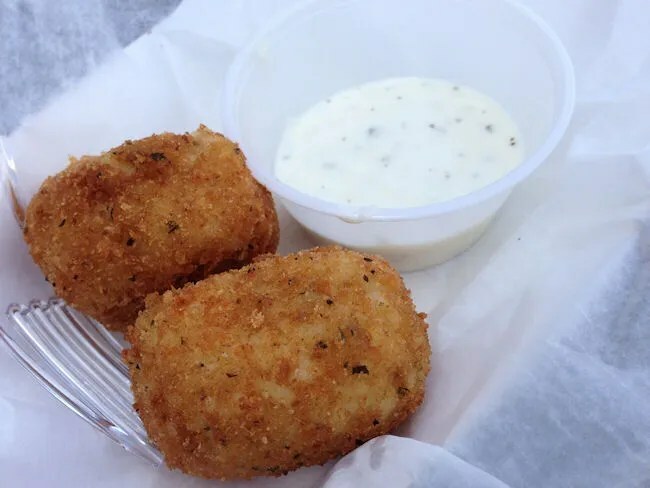 These delicious fried balls are made with Orzo pasta, Parmesan, fontina, and asiago cheeses. There were only two of the croquettes with the order, but they were a pretty good size. They were fried up fresh and using the Orzo pasta is an interesting choice. Once you bite in to it, the balls pretty much fall apart, but the pasta is so creamy and cheesy…but not in the typical Mac-N-Cheese way. My lunch cost me $14 and fortunately, I was able to use a credit card. Both the sandwich and the croquettes were delicious. It did take quite a while to get my meal which was a little disappointing. J and I didn’t even get to eat together as she and L were done before I even got mine, but that one little setback can probably be blamed on the huge crowds Lunchtime Live is drawing.